The international residency component of the Drexel LeBow Executive MBA program has taken students across the globe: to Chile, China, Cuba and numerous other countries in Asia, Europe and South America. This year’s residency marked the program’s longest trip from Philadelphia yet: over 8,000 miles, to Vietnam. 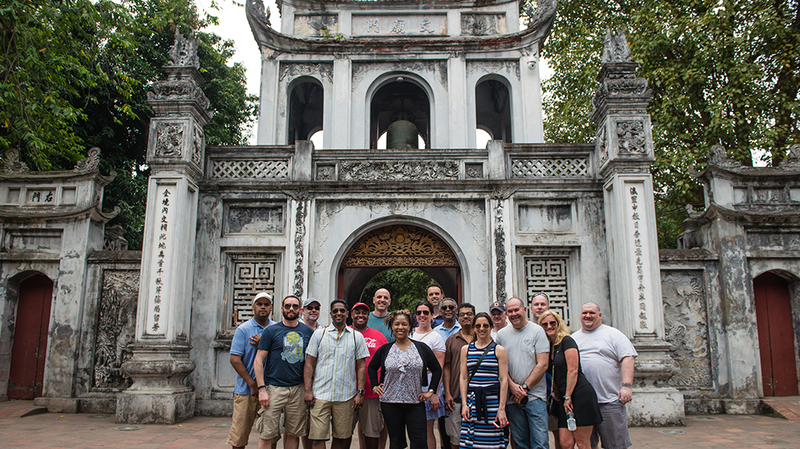 The ten-day visit, from April 18 to 28, was the first EMBA international residency in Southeast Asia; a group of MBA students, with former Dean Frank Linnehan, previously traveled to Vietnam in 2014. For the 16 EMBA students who went on the trip, it served as the eagerly-awaited finale to their studies, as they, along with Associate Professor of Management Suresh Chandran, LeBow alumnus Randy Holmes ’70 and several staff members, took in a range of scenes and experiences spanning the country. In Hanoi, the cohort made site visits to businesses such as Interseco Corporation, Maritime Bank and Phu Thai Cat – the country’s only authorized dealer for Caterpillar, the construction equipment manufacturer – for explorations of banking, finance, and investment strategies in Vietnam, as well as global supply chain solutions. The LeBow contingent also met with Stuart Schaag, Senior Commercial Officer at the U.S. Embassy in Hanoi, for an overview of economic and political relations between the US and Vietnam and a discussion of American business interests in Vietnam. On April 24, the second leg of the trip began, with the cohort flying to Ho Chi Minh City, the former capitol of South Vietnam. Activities in the city formerly known as Saigon included visits with MullenLowe, TRG International and Esquel Garment Manufacturing, as well a cultural visit to the Cu Chi Tunnels and a nature outing on the Mekong Delta. 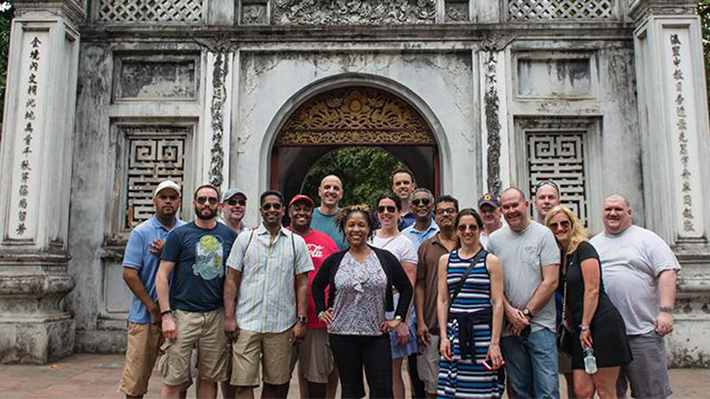 The 2018 Drexel EMBA cohort traveled to Ho Chi Minh City and Hanoi, Vietnam for visits and cultural excursions.